If deer are starving or exist in large numbers, especially in the winter, they will eat any plant or at least take a big bite out of the plant. But come spring when the grass is green they will become picky. My front yard is filled with blooms and open to the deer and yet I have seen them walk on by. It is important to understand how a deer functions. They have really big noses and smell is one of their strongest senses. It is is part of their warning system. For that reason most deer repellents are based on scents that you spray. I’ve never used commercial repellents but use instead plants that are scented. Plants that are strongly scented make them nervous, and encourage them to walk on by. That being said, I noticed this spring that a deer had taken a big bite out of some garlic tops. Years ago I planted garlic near the roses to repel insects. The garlic has self sown and shows up all over the front yard. And, garlic is one of the first things to sprout green. So the deer must have been really hungry. I've not noticed any more munching. One of the first flowers that repels the deer in my garden is a dwaft purple iris. The locals call it a flag. 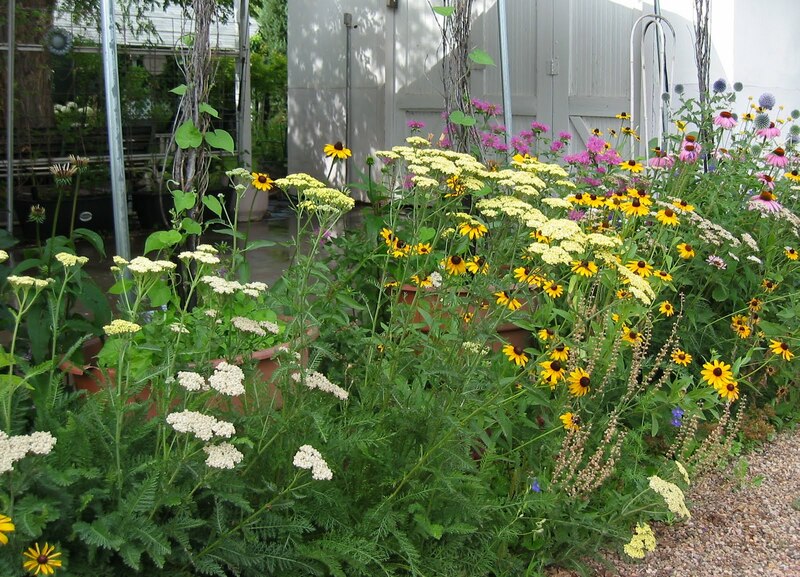 These plants are all perennials. In the front garden, I also have lambs ears, lavender, poppies, horehound, catmint also repels deer. I also grow species tulips, daffodils, mock orange, an ornamental orgegano, salvias, penstemons, sedums, veronicas, and a dictamus (lemon scented gas plant) and more. I had 3 big pots with supports. Morning glories bloom in the late summer. At one time I had 20 rose bushes in the open front yard. Then the deer population exploded. I have moved almost all the roses. I moved some to my enclosed back yard. Others I gave away. I am making my front garden more xeric and deer resistant. I like gardening in my little back secret garden. Dear Gloria, Your front garden looks absolutely delightful. So well stocked and so colourful I am sure it must be constantly admired by people passing by and, happily, ignored by the deer. I had no idea that they were such a problem for you and actually meant having to move all of your rose bushes. I should have thought the deer would be nervous of people and traffic - clearly this is not the case. You are lucky. In my area - south central CT - deer eat echinacea, monarda, and roses in spite of the closely planted garlic chives that have a very strong garlic scent. This year I even had a deer take a few bites of early narcissi and they definitely eat early mini iris and crocus. Deer tastes are very regional and individual. The only tried and true remedy I've found is a fence. I still have lovely gardens in the deer open areas, but I have a very limited number of plants I can safely put there. Dear Edith - the deer become very accustomed to humans, and at times can be aggressive. The town did harvest many of them so the problems is less. But they are abundant in our countryside. Joene, it really is trial and error with those lovely creatures. The garlic didn't work to keep them from my roses either. And some years they will eat the mini iris and crocus. But they do avoid the dwarf flag. I did find that they didn't bother the William Baffin Rose or my Carefree Delight. I left them as an experiment. Hope it works. Kate, I need to add some catmint. I dug out 5 roses from a bed which required me to go in there and basically redo the whole bed. Energy bets energy. But sometimes work makes more work. I am sure that this will be extremely helpful for those who have to struggle with deer. I love Salvias and am not surprised to hear that deer do not like them because they do have a definite scent, don't they? Your garden looks beautiful Gloria. Here, at least so far, the deer completely ignore lavender, Rhododendron, rosemary and daffodils. They browsed my Salvia 'purple majesty' the first year...repeatedly, and yet last year they didn't touch it. It's funny how their taste can vary from year to year. Hi Noelle, yes the salvia are very scented. I used to grow Clary Sage and I could not stand the scent! It was so pretty visitors always wanted to touch it. The scent quickly gets on your fingers. That would be a super plant to shoo away deer. Jim, you made me laugh! You need some kind of deer anti-trampling device. Jean, fortunately we don't have woodchucks! I've made my front yard more "xeric" and deer (OK, moose) resistant, too. It's just cheaper, saves time, and minimizes anxiety. Of course, it does nothing right now: the front yard is under snow. At least the moose won't dig in the snow for things...that I know of! Gail, they once got into my back yard and did some permanent damage on a prize dwarf pine tree. My husband suggested I rip it out, but it is the most expensive plant I have ever bought. It finally did fill in on top. The deer pruned the bottom. Christine B, I am so glad we don't have moose. We have on the outskirts of town a growing elk population. I hope they don't move into town. You still have snow cover? ouch! We have been having wind and a bit of rain, but I have been in the garden doing some big changes. Does it happen with you the same way? You aren't planning a change, but you're out there in the garden and all of sudden you get this aha! moment and start ripping this apart? I have to quit doing that! We are lucky not to have to deal with deer in our area. You've sure found some beautiful plant combinations. 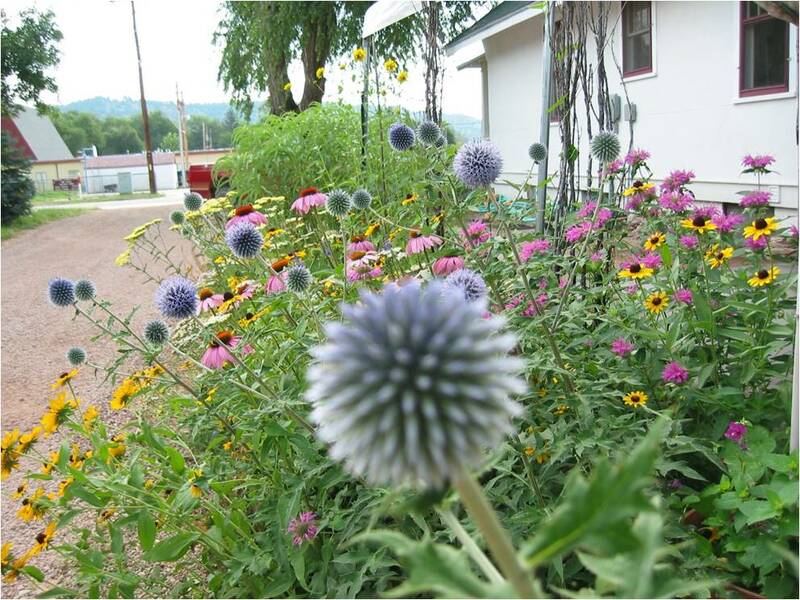 Seeing the Echinops in your garden has convinced me I need to add some to mine. It's nice that you have your secret back garden that the deer can't get into. I love the blowsy full look of your garden along the gravel path. That shot of the purple little globes of allium nodding over the other flowers is great! I had no idea about the deer noses. It makes complete sense. Your garden is so darned wonderful. Your combinations perfect! Your flowers are so beautiful! I could spend hours in your garden, just admiring it! I bet that deer took a taste of that garlic, then remembered why his relatives avoid it: tastes bad and bad breath, too! Hi again, i love those information you are sharing although they will not be useful in my area. In our case, the native ranging chicken, sometimes the small goat's kids eat the plants. But we just managed to live with them in the province, survival of the fittest is the game. I love how you "put the deer out" anecdote: a fence behind a fence behind a fence. I LOL really with this. Exactly true! Catherine, Those echinops are fun. They reseed easily and come back every year. Tina, you are too kind. I love your gardens! Hi Laurie, thank you. This gravel alley was just weeds. It sits in a bit more shade and I don't mind deadheading the tall plants. Hi Andrea, It is fun to see how gardeners all over the world learn to cope! I love your beautiful tropical plants! Deb, LOL - Deer breath! I bet that deer was sent to the corner! Shayama, Deer can be a huge problem. I don't think they like marigolds. Sunflowers, they would probably eat because they are human food. The problem with deer is that if there are alot of them or there is not a prefer place to eat, they will eat or bite into anything! I read somewhere that deer are like toddlers they prefer bland and smooth food. They don't eat the mock orange and when it is blooming they truly stay away. But, I once cut it down to just inches (revive an old shrub) But, we found they loved the tender new leaves. I covered it with that super light black netting and they left it alone. Now it is a strong shrub that they pass by. Also deer are creatures of habit. They tend to follow a certain path everynight. If you break up their path with a temporary barrier sometimes they start going another way.....Since you are starting new try very scented plants. You may have to cover with netting at first. I have a friend who sprays one of those commercial deer sprays. I don't have the patience or time to spray. Gloria - Thank you very much for a quick response. Your suggestions are going to be very helpful for me. I live in central New Jersey and we have dozens of deers in our back yard.